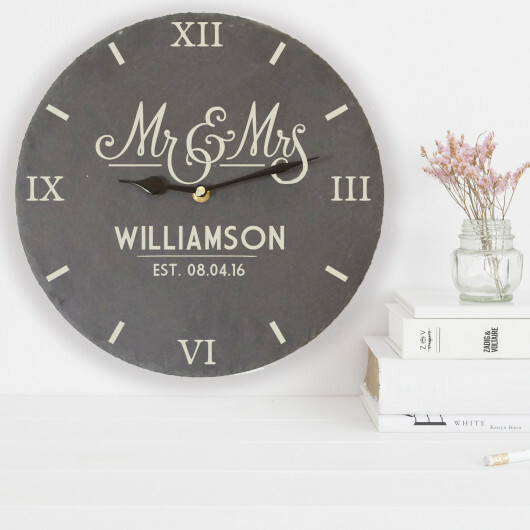 An elegant gift, perfect as a wedding or anniversary gift. Give the gift of time with this beautiful Mr and Mrs Slate Clock, featuring a charming design that will fit anywhere in the house. 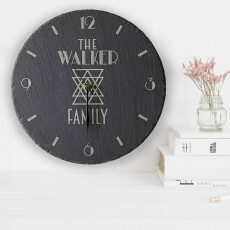 Personalise this wonderful gift with the family name (up to 15 characters) and special established date, making it a one of a kind gift that no one else will have. A wonderful gift for a wedding, anniversary or any special occasion. Please note, the surname will be engraved in uppercase regardless of how you type it. Please do not include accents and special symbols as they will not be included when it is engraved. This includes accents above and below the alphabetical or numerical text. Your text will be printed exactly as you have entered it on each link in the boxes provided, so please double check spelling, punctuation and capitalisation. We will not add punctuation or amend incorrect punctuation. We will print exactly what you add into the box so please ensure it is correct. We cannot refund or replace your order if it is your error. Please note, much like everything in life, nothing is perfect. 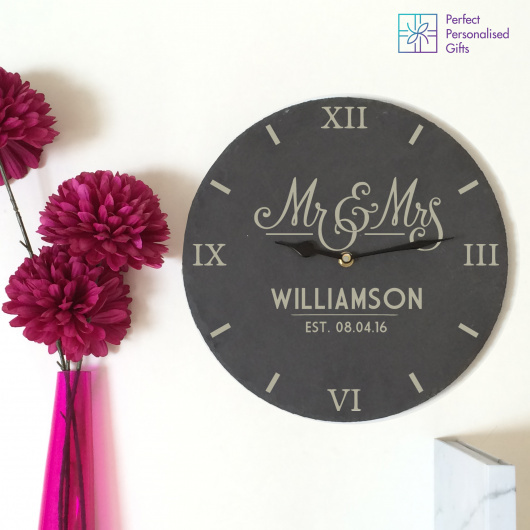 Our slate clocks are made from natural slate so also comes with those natural imperfections. But we feel this adds to the rustic natural tone of the gift. 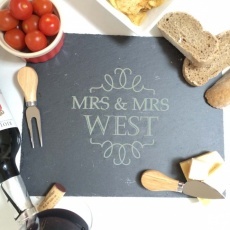 You might spot mottling, fine grey thread lines, colour blemishes, flecks of fools gold and maybe a few cracks, but we hope you’ll agree that they add to the character of the natural slate design! 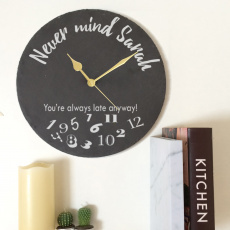 This gorgeous clock measures at approx. 30cm x 30cm. All clocks now come with silver hands instead of black/gold. Shopping last minute? Don’t worry, just select next day delivery when you order and you’ll have your gift with you as soon as tomorrow!